Banus Alor is a Dunmer assassin and Speaker of the Dark Brotherhood's Black Hand. The duration of Banus Alor's membership in the Dark Brotherhood is unknown. He is highly skilled in Illusion, Sneak, Destruction, and Blade. During the Honor Thy Mother quest, he is murdered by Mathieu Bellamont. 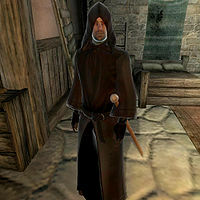 Unlike several of the Black Hand members, Banus Alor is not yet known to be found outside of the Applewatch Farmhouse or the Night Mother statue during the final Dark Brotherhood quests. He always wears the robes of a Black Hand member with a matching hood. He also carries a brown shirt, a pair of light brown linens and a pair of doeskin shoes. He carries an unenchanted iron longsword as his only weapon, and a middling amount of gold. Speaking to Banus Alor will have him assure you that things will improve as soon as you visit the Night Mother: "Our troubles are almost at an end, Brother/Sister. Soon we will visit the Night Mother, and she will surely guide us." Asking him about Lucien Lachance will have him happily reminisce on the experience of slaying him; "The four of us attacking him in unison was as graceful and beautiful as a ballet! The flashing of steel, the spraying of blood!" Following a Lead: What have you been doing, puppet? In the game, it is stated that Banus is a Speaker of the Black Hand. However, in the construction set, Banus is only listed as a Murderer in the Dark Brotherhood. The information listed in the summary box is the construction set faction, because this is the information that controls the NPC's disposition, dialogues, and responses to scripts; see Factions for details. This page was last modified on 25 March 2018, at 02:41.